Fentanyl is one of the drugs behind the opioid epidemic destroying families and tearing apart America’s communities. There hasn’t been an epidemic of this proportion since the 1960’s and it still pales in comparison to the one we are facing in 2017. Every 12 minutes in the United States someone dies of drug abuse. America uses 80% of the world’s opioids but only holds 5% of the world’s population. Fentanyl is 50 to 100 times more potent than morphine. It is typically prescribed to patients with severe pain or manage pain after surgery, some patients use it because they are too physically tolerant to other opioids. It also is classified as a schedule 2-prescription drug, meaning it holds the same type of punishment as cocaine or methamphetamines. Fentanyl can be used on it own but is typically cut into heroin. It’s prescription form is known as Actiq, Duragesic and Sublimaze. When it’s sold on the street you can find it as China White, Apache, Tango and Cash and many other names. Fentanyl is found on the street as a powder, spiked on blotting paper, mixed with heroin or tablets that mimic other less potent opioids. It can be swallowed, snorted or injected and the blotter paper can be put in the mouth so it is absorbed through the mucous membrane. Heroin, morphine and other opioid drugs like Fentanyl work by binding the body’s opioid receptor’s, which are found in the areas of the brain that control pain and emotion. Once the drugs have bond to the receptors they are able to drive up dopamine levels in the brain’s reward areas, which then produce euphoria and relaxation. 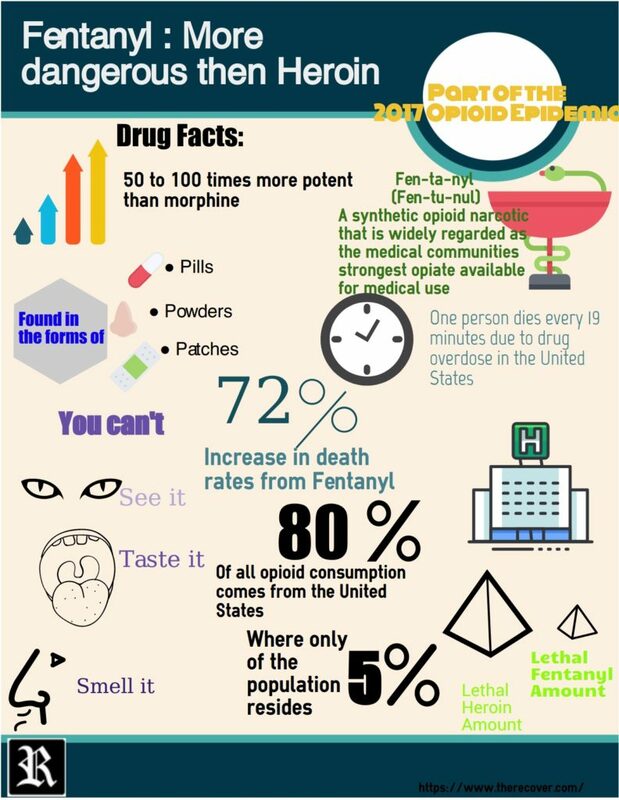 Fentanyl effects resemble those of heroin and include drowsiness, nausea, confusion, constipation, euphoria, sedation, addiction, respiratory depression and arrest, unconsciousness, coma and death. The opioid receptors are also found in the areas that control breathing rate, and high doses of opioids, especially potent opioids can cause breathing to stop. The high potency of fentanyl greatly increases overdose risks, especially if the person who uses the drug is unaware that the substance taken contains fentanyl. Since it is missed with heroin or cocaine, it then amplifies the potency and potential dangers. How can you reverse a Fentanyl overdose? There is a medication named Naloxone that is an opioid receptor antagonist that reverses opioid overdoses and restores normal breathing. Overdoses still need to be treated immediately even after using Naloxone and higher doses may be necessary to completely reverse the overdose. Increase your risk for anoxic injury (damage due to significantly decreased oxygen in the body tissues) and multiple organ system damage. Significantly increase your risk of overdose and death. Do harm to your personal life and relationships. Initiate or worsen pre-existing mental health conditions, including depression and/or labile (frequently changing) moods. Shallow, difficult breathing / respiratory arrest. Obtundation (altered level of consciousness). What happens when you detox from Fentanyl? Unfortunately coming “down” from the drug is a painful process and is what keeps most users continuously using to avoid from the withdrawal symptoms. Multiple patches: Since the patches are designed to absorb into the bloodstream through the skin over three days, some people abuse fentanyl by placing multiple patches on their skin. This increases the amount of drug being absorbed, so they are more likely to experience a high. However, the drug may take a long time to wear off, so a person who abuses fentanyl this way is more likely to experience harmful side effects. Injecting fentanyl: Many people remove the narcotic gel from the patch, heat it to melt it, or mix it with water; they will then use a hypodermic needle to inject the substance directly into a vein, much like how heroin is used. 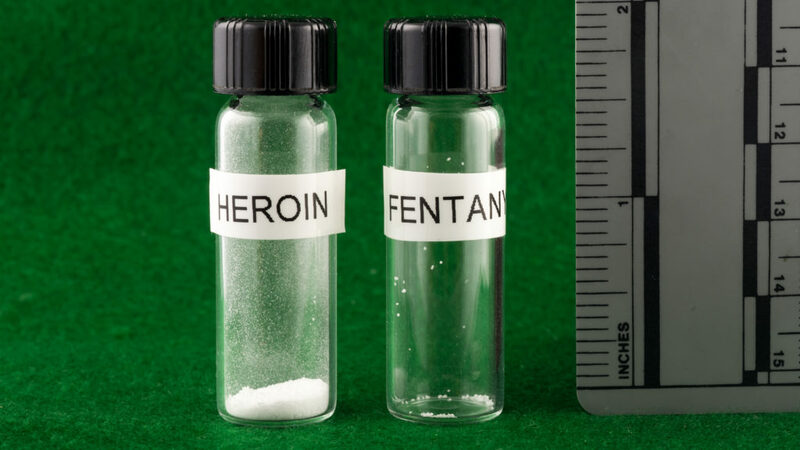 Fentanyl is, however, far more potent than heroin, and this method of rapid drug onset can also lead to rapid overdose. A more recent development in nonmedical fentanyl abuse involves boiling the patches rather than cutting them open and then injecting the resulting liquid. Snorting: People who snort fentanyl are less likely to take the gel from patches and snort that; the illicit, powder versions of the drug sold on the black market are more bioavailable when snorted. However, some people do still remove the contents of fentanyl patches and snort them, with or without preparation to create a powder. Smoking: As with heroin, fentanyl is sometimes smoked. The gel or liquid inside the patch is removed and heated, and the resulting smoke and vapor are then inhaled. The drug enters the bloodstream through the thin membranes in the lungs, so it quickly reaches the brain. Chewing the patches: Another method of orally ingesting fentanyl involves chewing the patches without otherwise modifying them. This can break the layers in the patch and release most of the drug all at once. The fentanyl is absorbed through the mucous membranes of the mouth. This can rapidly lead to overdose. Because of the severity in this type of addiction, Fentanyl treatment usually requires the help of a qualified medical professional to comfortably and safely detox. Most heavy users require a medication to help with the process and stabilize the body while ridding itself of the Fentanyl. Detoxing under the supervision of a medical professional helps keep the patient accountable and insures they will continue the detox instead of sabotaging it by trying to alleviate withdrawal symptoms. Once the detoxification has finished, a rehabilitation center is recommended to combat the high relapse rate in most fentanyl users. While in treatment the patient can continue their recovery by treating the source of their abuse with either mental or physical health treatments. Outside of treatment, there are support groups, such as Narcotics Anonymous, found around the country to help recovering addicts from relapse and to keep them in active sobriety. NA has a nationwide database that can help connect those searching for help find a meeting in their own neighborhood.